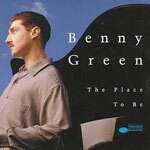 CD review: "The Place to Be"
Benny Green continues to duel Marcus Roberts for the role of the best young jazz pianist. The former Art Blakey and Betty Carter band member's latest release has a harder edge to it than his previous recordings, and he displays more willingness here to take chances. At the same time, Breen maintains his commitment to warmth and melodicism. And his development as a composer makes significant strides here. To give just one example, "Nice Pants," the opening track, features a catchy melody without being lightweight. The backing band, anchored by the seemingly omnipresent Christian McBride on bass, is outstanding  playing with aggressive energy, constantly pushing Green.